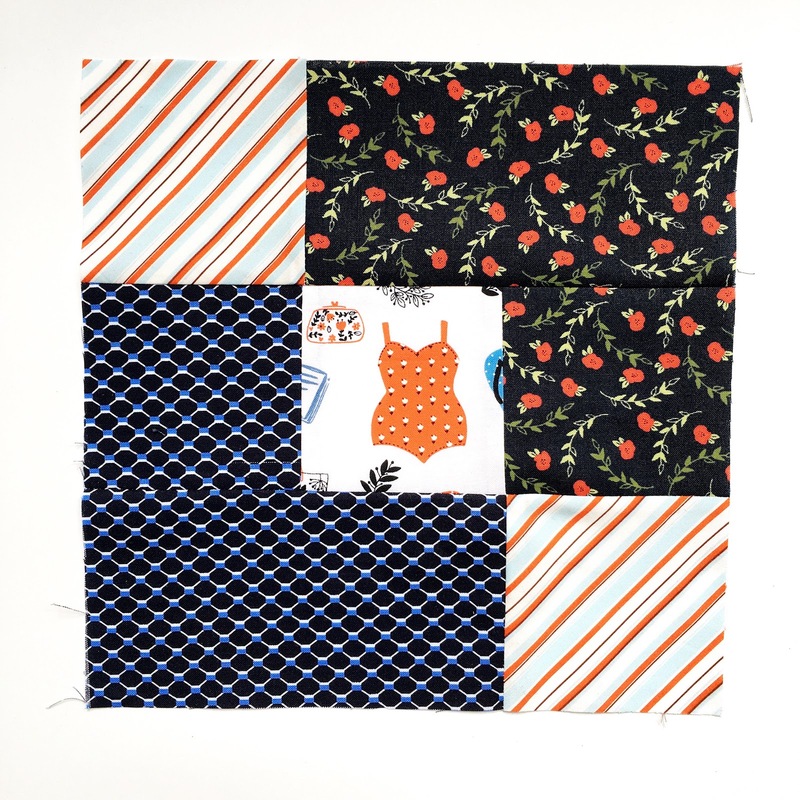 This past week started the Fussy Cut Sampler Sew Along! My friends Elisabeth and Nichole wrote this fantastic book about something that is near and dear to my heart...fussy cut quilt blocks! Fussy cuts are a way to add an element of surprise, bring a block to life or tell your personal story. 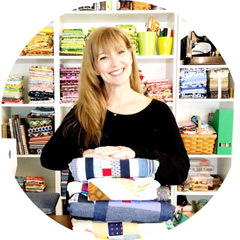 You can start your fussy cut stash by looking in your existing fabrics! There really is fussy cut potential in almost all small print fabrics! if you do not have a huge stash, you can start asking your friends if they would like to swap or find organized swaps online. And even I am not above buying scrap packs from time to time! You can find scrap packs in Etsy shops or sometimes in fabric destashes on Instagram. Block One is a fun fussy cut fabric sent to me by +Pat Sloan! Vintage FAB! Block Two won votes on my Instagram stories! The Heather Ross vans are always a winner! I chose them and and his dog for the center and the campers for the outer two spaces to keep it less cluttered and to give a more complete overall look. It compliments instead of competes. 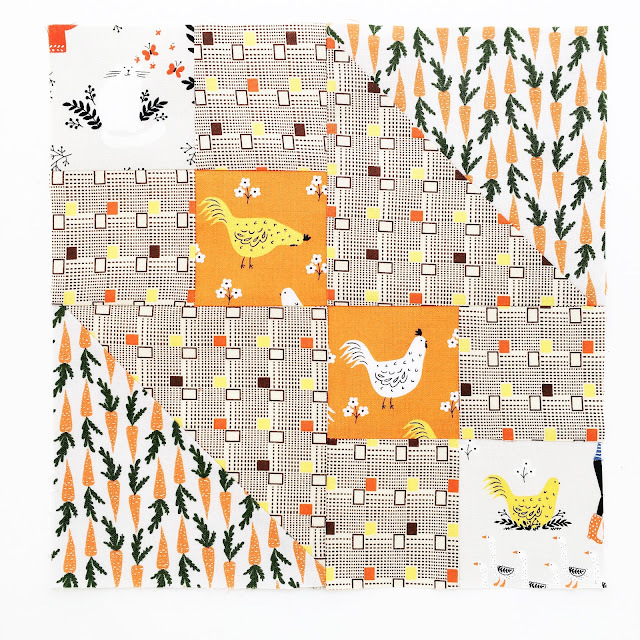 The chickens were another Instagram viewers choice winner! There is a cat in the upper left corner too ( someone has to keep the chickens in line) but she is very difficult to see hiding in plain view ( as cats do)! I simply could not resist all of the crazy HOT PINK and red dots when I found this tiny piece of cake! 1. Spray starch! I LOVE starch! I may overuse it but it helps the fabric keep its shape and gives you crisp blocks. 2. Aurifil 50wt. This is the most popular and best piecing thread. It is strong, thin and will not let you down. This thread melts into the fabric to give you the most accurate seams and the flattest backs you have ever seen. Not all 50 wt threads are the same. The weight is the raw material, not the final product. 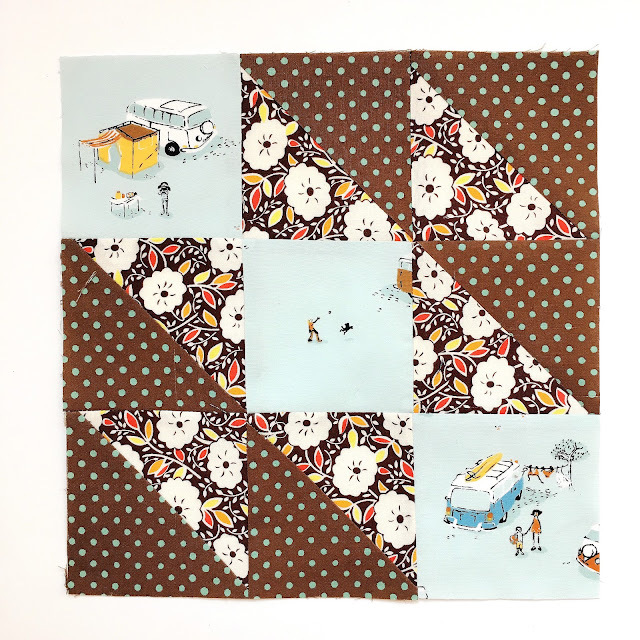 I hope you will join the fun of this sew along with these fast beautiful blocks! You do magical things with fussy cutting, Kim. :) And you are so right about all 50wts not all being the same!! lots of fussy cutting here great blocks especially loving the chickens one.Have not tried aurifil thread due to the cost prohibited when an OAP!